Each Sunday we take a moment to celebrate some of the fun, inexpensive, offbeat stuff you can buy when you’re stuck at the airport. This week: meet Corny Cob. Or is that MR. Corny Cob? According to Pam Hinman at the Eastern Iowa Airport (CID) in Cedar Rapids, the 6-inch tall “Corny” is a bestseller at the airport. The airport also sells a lot of corn-themed T-shirts with corn-pone slogans such as “Not everything is flat in Iowa,” “What happens in the Cornfield stays in the Cornfield,” and “Got Corn? ; ” but they cost more than $10 (our limit for Souvenir Sunday), so we’re just letting you know about that. And, while poking around the Eastern Iowa Airport Web site, I noticed that the airport is also about to kick off a ticket give-away contest with Allegiant Air. Two round-trip tickets anywhere Allegiant Air flies from Cedar Rapids will be given away at every University of Iowa Hawkeye football home game from now until November. To enter, you’ll need to guess what the wind speed range will be in Kinnick Stadium at kick off. So, Hawkeye Fans, get out your anemometers. Don’t have one? The folks at the Franklin Institute have kindly posted instructions on how to make your own anemometer out of paper cups and straws. While you gather your supplies, here are the contest details. 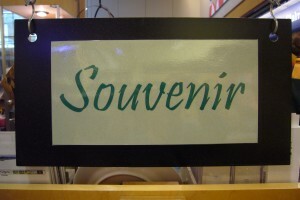 Have you found a great souvenir while you were stuck at the airport? If it’s under $10, fun, offbeat and “of” that city or state, please snap a photo and send it along. It may be featured on a future edition of Souvenir Sunday.